Your career site should be a top source for driving qualified candidates in the door. Serving as a landing spot for anyone that comes across your jobs, easily provide direct access to job requisitions and much more. From there, use your back-end applicant tracking system, to monitor the sources of hire. 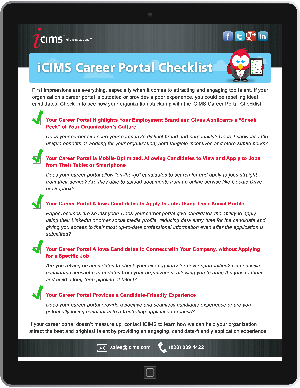 View the iCIMS Career Site and Applicant Tracking Guide to see a career site checklist, a mobile recruitment eBook and a demo of the iCIMS Talent Platform.